A lot of attention was given at the end of the 19th century to the "what if" the Confederates occupied the Little Round Top at Gettysburg, but there's the Big Round Top nearby and the Confederates took it almost without a fight. Would it be better for them if they just sat on it and not have committed themselves to the Little Round Top fight? I know that placing artillery on top was probably not possible, but it might still have been a good position, as the Federals were nervous about the Confederates being there and drove them away. EDIT: I think I now understand. While something akin to a victory might have been possible on either Round Tops, a concentration there and subsequent baiting for a Federal attack was not general Lee's intention. He wanted to smash the Union left wing in a frontal attack and cause a rout. When that failed, there was no secondary objective (like taking the Big Round Top). The only good idea for the Confederates that day was to withdraw from this accidental battlefield so favourable for the Union, and resume a Fabian strategy of living off the Pennsylvania country side. Never mind the consequences of a defeat, the Confederates couldn't afford the casualties required for a victory. All the lessons of Napoleon may not have been fully embraced by historians and theorists. The wrong lesson may have been learned by the great military leaders that followed. This wrong lesson, or misconception of Napoleon, is that a war could be decided by a single battle. This misconception created a singular vision towards military operations and would influence military instruction in the nineteenth century. This singular vision, or desire to end the war with a single decisive battle, may still linger in the minds of present day officers and hinder understanding of operational art. Epstein proves that this is clearly the wrong lesson to derive from the study of Napoleon. It may have been this wrong lesson though, that planted the desire for many leaders to emulate Napoleon. After Napoleon military leaders desired to obtain the one quick decisive battle to end the war. It was not to be. It would take another genius a half a century later to figure it out, his name was Ulysses S. Grant. Can't we just sit for once, and let the damn Yanks come at us instead. It was, after all, in the disastrous charge by Pickett the next day where nearly half of all Confederate casualties for the battle were incurred. The truly awesome defensive capability of a modern army, that would be exposed to the entire world in 1915 at Verdun, was already evident, for those willing to see, on the Round Tops and Cemetery Ridge in that first week of July, 1863. Lee, on July 2 and 3 1863, choose to accept any number of Confederate casualties for the pipedream of winning the Civil War in a single battle. Ironically, the consequent destruction of his army's offensive capability ended all hope for a negotiated settlement with the North. Like the Japanese commander at Midway eight decades later, Lee was the only commander on the field who could lose the war in an afternoon. First of all, Little Round Top is generally considered the more valuable of the two. So there are two issues. The first was, given Confederate possession of Round Top, should they have played "double or nothing" with Little Round Top? The second issue is whether Big Round Top was worth having (and keeping) in its own right? The earlier historians (around the turn of the nineteenth and twentieth centuries) believe that the two Round Tops were the hinge, or key to the Union line, and its left flank, and that the Confederates had lost a major opportunity by not occupying them earlier. If you believe this, you might be torn between holding Round Top, and playing "double or nothing" by going for Little Round Top. In any event, under this view the Confederates lost their best chance when they failed to take Little Round Top, and their remaining chances when they were driven back from Round Top. The "modern" (late 20th century and later) position is that even the Little Round Top was irrelevant to the later fighting. That's because neither hill was particularly good for placing artillery; Round Top because it was too forested; Little Round top, because it was too rocky. Meade and other Union generals considered and decided against "flanking" Pickett's charge from the Little Round Top because it was too far for infantry. More to the point, General Lee was unhappy about the diversion of the Confederate troops to the Round Tops; if they had broken the Union line higher on the ridge above Devil's Den, it would have obviated the need for Pickett's charge because the Confederates would have won the second day. In these lights, the actions of Union General Sickles have been re-evaluated. The earlier version considered him reckless to shorten the Union Line by abandoning the Round Tops and occupying the Peach Orchard. Modern historians are more likely to believe that this action, taken against orders, saved the day at Gettysburg. I had three ancestors at Gettysburg. One in the 16th Michigan on little round top. They remained on top of little round top as Chamberlains 20th Maine charged down and attacked the confederates from the side. As you say, Big Round top or just Round Top was behind the Confederate Lines. They did occupy Big Round top. Would it have been better for the Confederates to have just sat on top of Big Round top and not have tried for Little Round Top. Absolutely. Given Gettysburg broke the confederacy's back and from that point on they never took the offensive in the war again. It would have been better if they never got out of bed that day... Two maps below show July 2, and July 3 positions respectively. 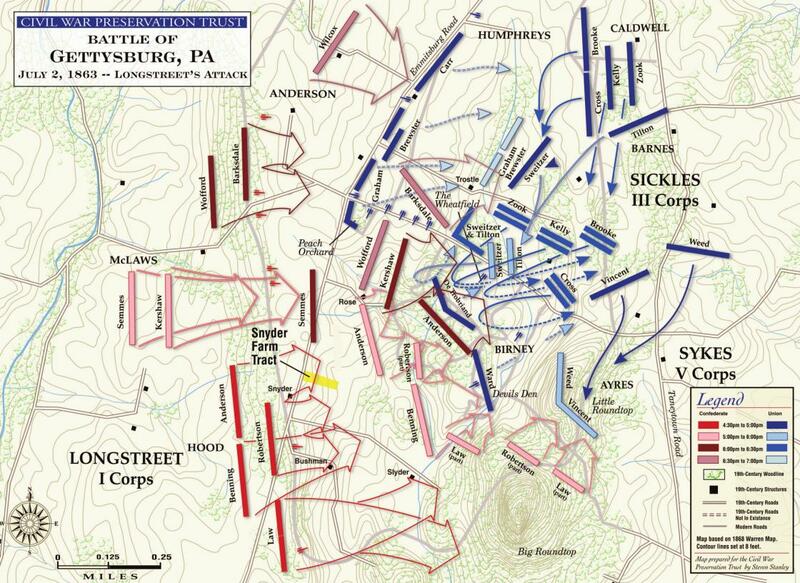 The issue was that the Union had the high ground (Cemetery Ridge) and the more defensible positions. By attacking Little Round Top at the unions left, the Confederates were trying to flank them and fold up their lines. They were trying to avoid the costly frontal charge which they ultimately did attempt in Pickett's charge.. During this frontal attack on Cemetery Ridge, The attacking Confederates(Picket,Pettigrew,Trimble, Wilcox,Lang) had 50% casualty rate, or 6000 men. There is a plaque at the Gettysburg Battlefield where they temporarily penetrated union lines.. On that plaque it says "The High Water Mark of the Confederacy". The last major offensive by the south of the civil war, from this point on Lee retreated. And to your point.. Why did Lee attack the Union in such fortified positions. General Longstreet objected on the same grounds.. He counseled that Lee should retreat, the Union's fortifications are too strong. But Lee felt the opportunity of defeating the union army was too tempting to ignore and overruled Longstreet. It was the biggest mistake of the war for Lee. 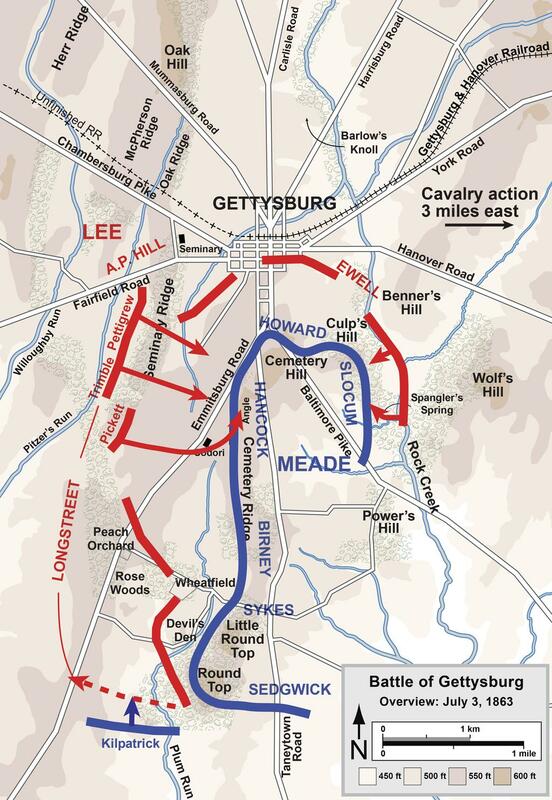 @user1095108, Lee was in "frontal mode" at Gettysburg even on the 2nd day. His "en echelon" order to attack was essentially an order for a frontal attack, not an attempt to flank the union line. I never read anything about whose idea the flanking attempt on Little Round Top actually was. Lee Ordered Longstreet to flank the Union Army on August 2nd. (2nd day of the Battle of Gettysburg). About 4 p.m. on July 2, 1863, Confederate Lt. Gen. James Longstreet's First Corps began an attack ordered by General Robert E. Lee that was intended to drive northeast up the Emmitsburg Road in the direction of Cemetery Hill, rolling up the Union left flank. Climbing Little Round Top, Warren (Brig. Gen. Gouverneur K. Warren, General Meade's Chief Engineer) found only a small Signal Corps station there. He saw the glint of bayonets in the sun to the southwest and realized that a Confederate assault into the Union flank was imminent. He hurriedly sent staff officers, including Washington Roebling, to find help from any available units in the vicinity. The traditional view—one that emerged in the 1880s—is that the left flank of the Union army was a crucial position. An example of this view is from 1900: "If the Confederates had seized [Little Round Top] and dragged some of their artillery up there, as they easily could have done, they would have enfiladed Meade's entire line and made it too unhealthy for him to remain there." To your point there are alternative theories about the importance of Little Round Top. Not the answer you're looking for? Browse other questions tagged american-civil-war battle or ask your own question. How many soldiers were present at the charge down Little Round Top? Could the Confederates have done better at Gettysburg if they had put cavalry in front of, rather than behind, Pickett's charge?